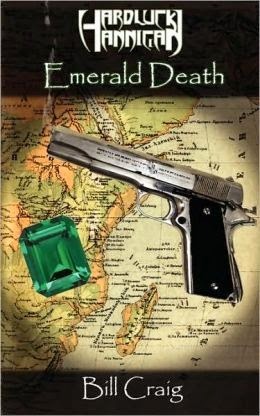 The first novel in Bill Craig's series about 1930s adventurer Michael "Hardluck" Hannigan, who first appeared as a much older man in Craig's novels about modern-day Police Detective Jack Riley. In Emerald Death, Hannigan arrives in Africa aboard a tramp steamer called The African Queen, from C.S. Forester's novel of the same name. It is also mentioned that Hannigan's reluctant ally, Father Niles McKenzie, learned a technique for concealing himself in darkness from a monk in Tibet, who also taught the method to another American, a pilot named Allard who spent time in the mountains after the Great War. This is a reference to Kent Allard, aka the Shadow. The second book in the series, The Sky Masters, which I have not yet read, has an appearance by Signor Ferrari from Casablanca. A recurring villain in both the Jack Riley and Hardluck Hannigan series, Chi Pei, appears in Craig's story "The Eye of Ka," found in the Airship 27 anthology Tales from the Hanging Monkey, Volume 1. All four of the stories in Tales from the Hanging Monkey have crossovers, and feature the same cast of main characters. Interestingly, Chi Pei has green eyes, employs a dacoit as a henchman, and is sometimes known as "the Devil Doctor." While his similarities to Fu Manchu are obvious, Chi Pei's pale skin and mustache do not fit with Fu's physical description.